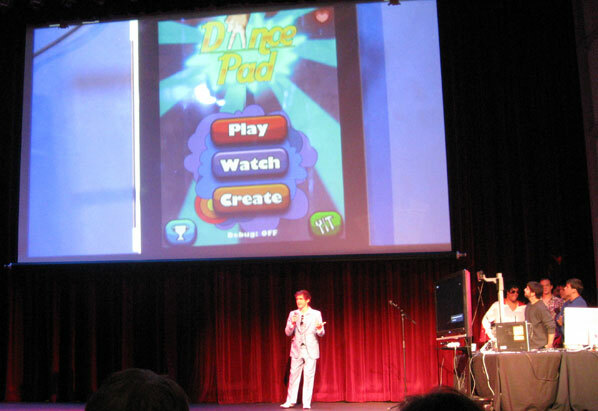 Dance Pad was demoed before the lunch break but it makes more sense to include it with the other mobile/portable games. 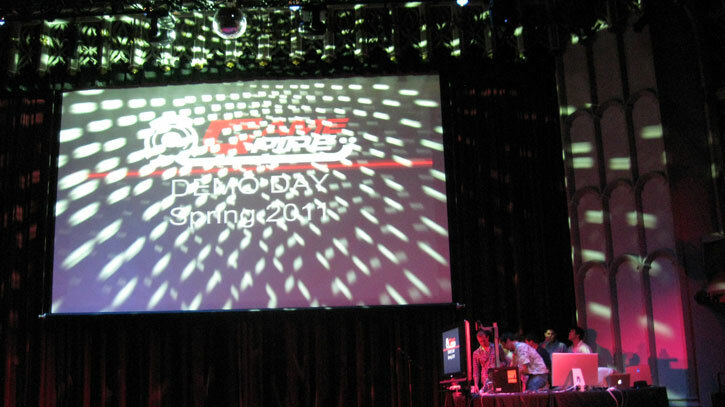 The team summoned the mighty disco ball from the ceiling and bathed the auditorium with music and spinning lights. The main speaker for the team came out dressed up in a light blue tuxedo reminiscent of the disco era and really captured people’s attention. The premise of Dance Pad is to use your fingers to “walk” the dance floor of the iPad while following the step bubbles ala Elite Beat Agents. You use your index finger as the left “foot” and your middle finger as the right “foot.” The game signals each finger by using a blue circle for index and a purple circle for the middle finger. Yes, it is possible to cheat by using a different finger but the game is more fun when you feel like your two fingers are dancing. The team said the game was inspired by YouTube videos of people using their fingers to mimic popular dance moves like moonwalking and breakdancing. 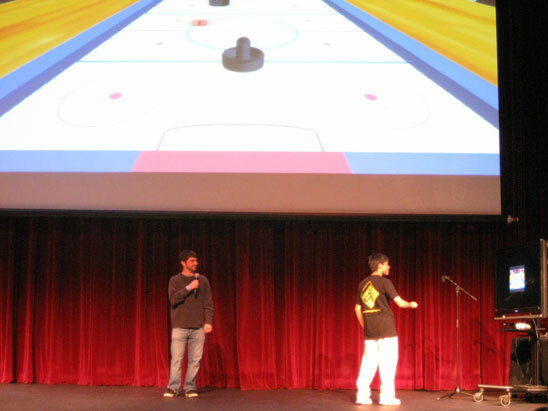 The team showed off the three different modes lives: Play, Watch, Create. 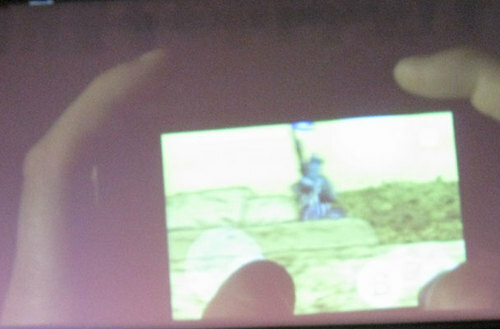 “Play” is the main mode where you can play the story with up to 2 people at once. 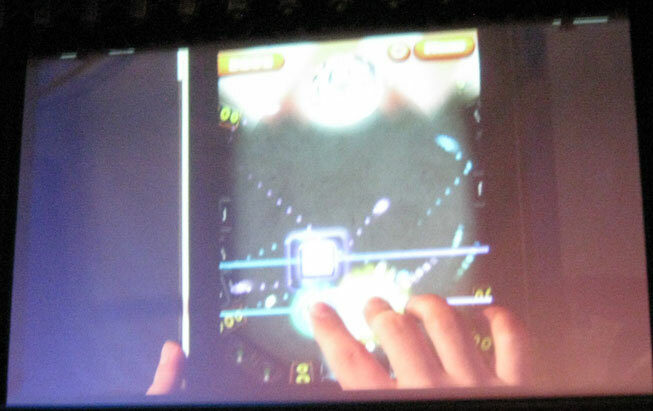 “Create” allows the player to create their own dance moves by touching the screen with their fingers. There are advanced features like a level editor and head-to-head competition where one person has to re-create the other players moves. You can choose to publish the levels and/or record footage to upload to YouTube. The “Watch” menu allows you to look at posted videos on YouTube of people showing off their impressive skills on different levels. 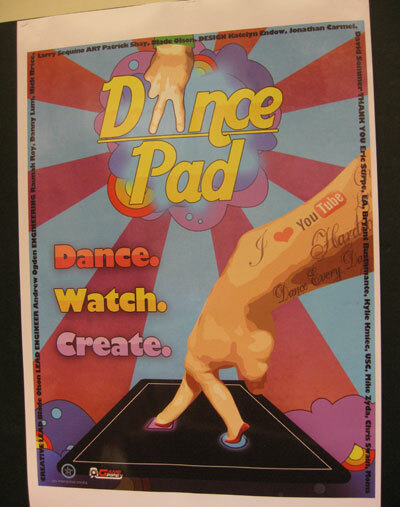 In the “Create” mode, two Dance Pad team members competed against each other by creating their own dance steps by using just their fingers. Each round alternated the creator but both people had to be able to do the routine to prevent someone from going crazy with impossible moves. The “Create” editor allows for full recording and fine tuning of step types to make more choreographed moves. Each single player level was shorter than I expected. The game package overall is impressive and should be able to sell well on iPad. The team is developing achievements and will have to decide how they want to proceed with Dance Pad. What you would expect from normal ice hockey except the controls are motion controlled. The team member used his right fisted hand to control the paddle and knock around the puck. There seemed to be some input lag from when he moved his hand and where the puck moved. The team had developed a really good AI player who did an excellent job of protecting his scoring area. Like real life, the person ended up scoring more on himself than by the AI. After a few points scored, a second puck appeared. Shortly after, the team member gained access to a second paddle and more pucks. The game then became really chaotic. The AI player could not defend against all the multiple pucks and when four appeared there was no way anyone could know what was happening. 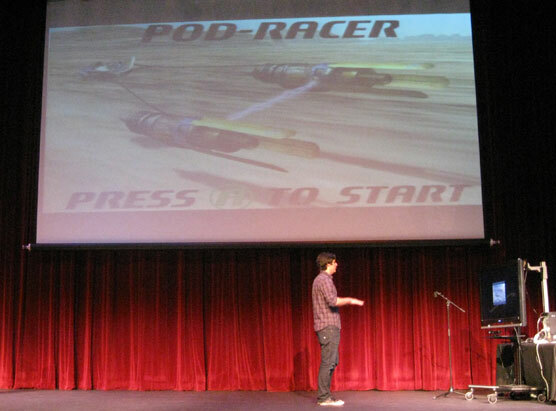 Pod Racer is a game completely inspired by the Star Wars Episode I: Racer from 1999. In the same spirit, the goal is to get the best lap time around the course while going through going through rock checkpoints. There were no AI opponents so the race felt very solitary on the mostly empty plain. The team showed the rock formations on the plain have collision detection by ramming the pod into them. There is a health system represented by a heart number which decreased in number upon impact. 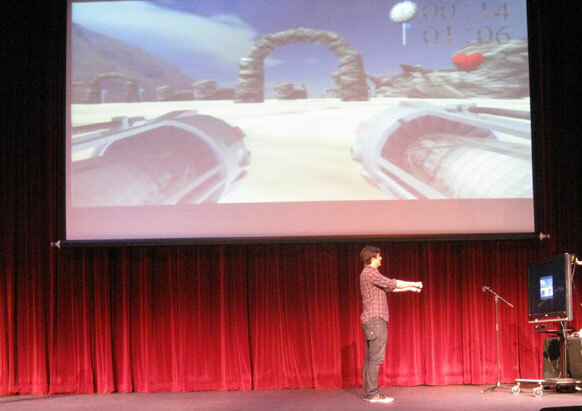 The development team used Kinect to simulate a person holding the pod racer controls. The person put both arms out straight in front of them and would pull one arm back towards him to turn in that direction. To boost, the person pushed both hands forward at the same time or move their pod racer over a boost pad. The controls seemed to work well with the wide level. I’m not sure the Kinect is accurate enough for the punishing turns and traps of the original Star Wars Episode I: Racer courses but the controls worked well in this game. 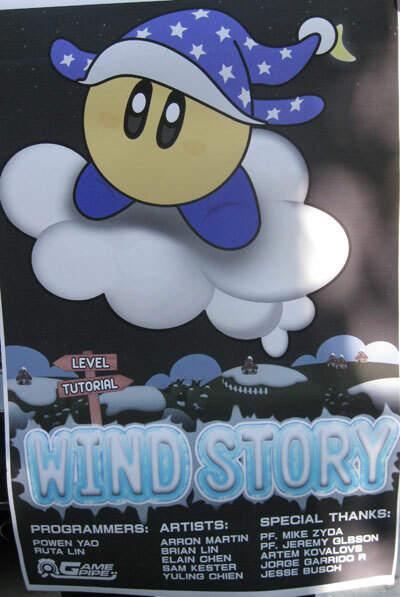 The final game from the Kinect development class was Wind Story. It’s a hybrid platformer which requires two people to play. 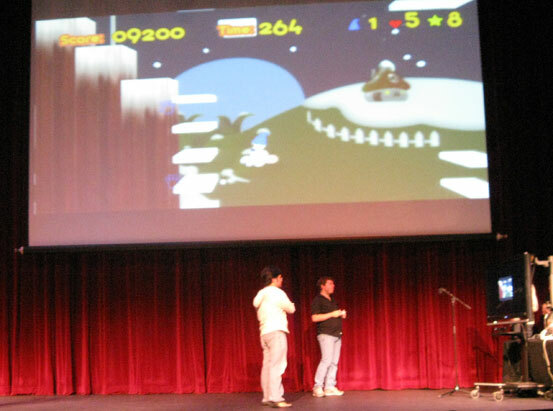 The first player controls the main character by using the Xbox 360 controller to move and jumps with a button. The second player uses their hand movements to create wind and fireballs to help the first player in his platforming and dispatch enemies. For wind going to the right, the player moves both their hands across the screen to the right. By putting the hands up towards the top of the screen, this summons fireballs. 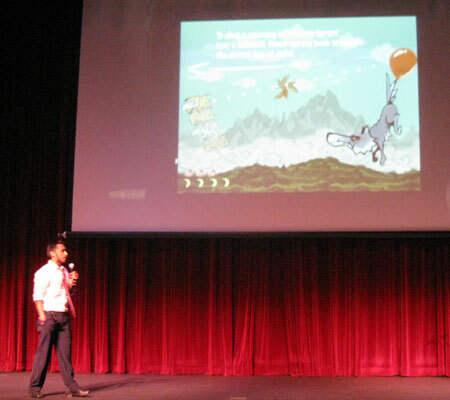 The development team showed off their tutorial level which introduces basic platforming and the wind ability. The main puff guy can jump and then the second player can moves their arms in a direction to cause wind to move the guy further in his jump. The team had a little trouble getting past the required jump+wind area. Later in the level there were enemies moving around which could be killed by fireballs. The second player puts their hands into the air to summon the fireballs and then uses the wind gestures to control their tragectory. The entire game had a cuteness vibe with the snow puff guy, the “boink” sound every time he jumped and the fuzzy enemies. It seems like the Kinect controls could be tightened to make it a better platformer overall. 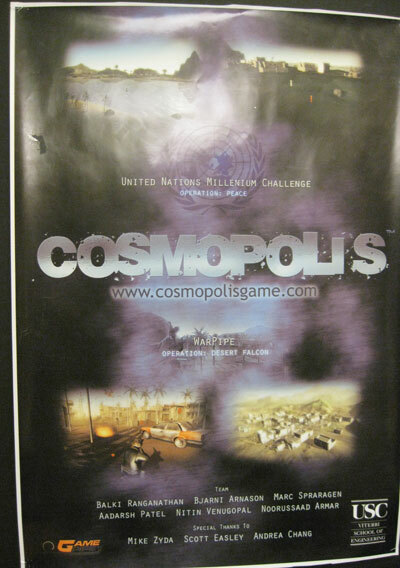 Cosmopolis is a MMO world created by graduate students for both scientific and recreational goals. The speaker talked about a UN simulation where the MMO player could interact with different groups and try and change ideologies through repeated discussions throughout social networks. He then showed a trailer and unfortunately did not show any live gameplay of any sort. Instead we got a lot of powerpoint slides. 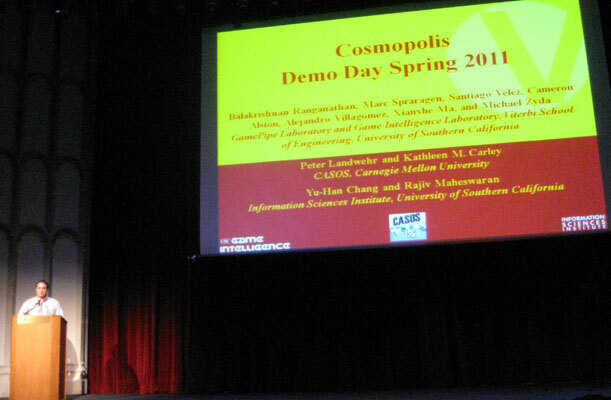 The goal of Cosmopolis is to eventually be an open MMO where people can develop their own games and social science experiments. One game under development is where there are robots battling each other and there is some sort of artificial intelligence routines being traded or upgraded to give a robot an edge. Again, since there was no live coverage, there really wasn't much for me to see and analyze this project. Imagine the opening of Fat Princess where the other team makes off with the princess from the castle. Then replace the human princess with a fruit princess and the castle with the produce section of a supermarket. Next alter the battlefield of Plants Vs. Zombies to become two player competitive where each person sends units to the other side of the board. I really enjoyed the opening video where it showed the fruit princess getting captured by the veggies. Welcome to Fruits Vs. 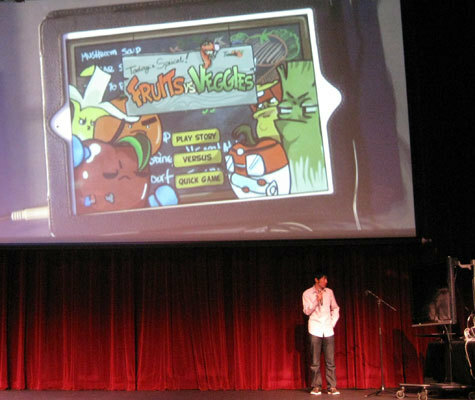 Veggies, a game developed for iPad. The live gameplay was a lot better than the footage shown in the trailer. 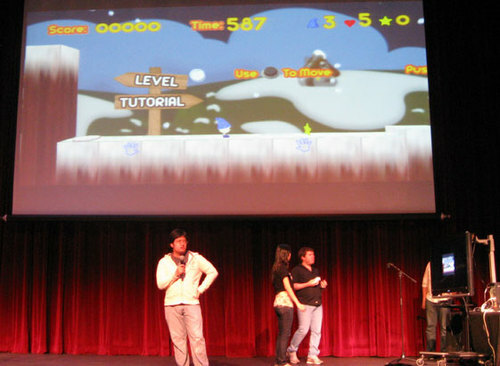 The team showed off the competitive two player battles where each player chooses their units and spells before battling. I watched an apple with boxing gloves punch celery with some awesome punch sound effects every three seconds. Each player added units to the 8 x 5 grid on their side and the units did battle with whatever unit they encountered. Something unique is each player has magic spells and traps to make the battles more dynamic. Everyone has heard pigs are devious as told by Angry Birds and other recent games. Here’s a story where a pig can fly and is getting attacked by birds (jealous are we?) and balloon aided wolves. Can you image how a pig would defend itself? Pork and Beans and swarms of flies. Yes, when the creator was explaining the game premise, I had to laugh at the awesome silliness of it all. 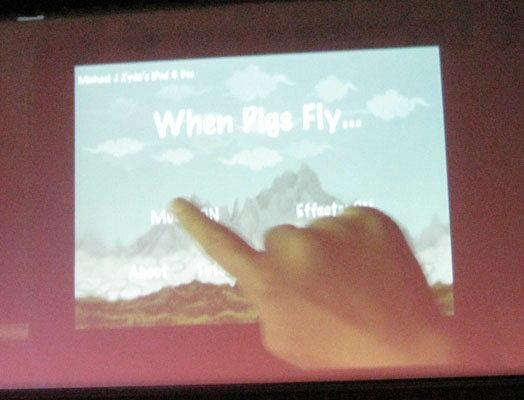 The live demo shows the player controls the pigs up and down movements with the iPad touch screen. The pig needs to collect apples and bananas to stay alive and should collect flies to ward off birds. The pig can ram into birds to stun them and the stunned birds can be launched at other enemies. You didn’t forget the pork and beans did you? The pig collects pork and beans to create a gas cloud which protects itself from the floating wolves. If the wolf is able to eat the pig, the pig is able to fart in the wolf’s mouth to survive. Ah, what class! The game was a lot of fun when I had a chance to play it later in the day. I liked how some of the gameplay elements seem farfetched while working so well together. 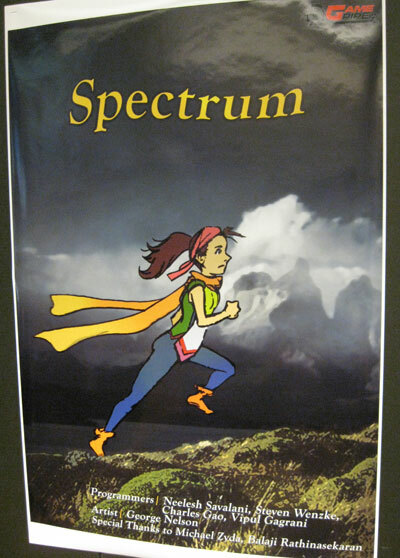 Spectrum is a side scrolling platformer for iPod Touch where a woman called Spectra must navigate through a colorless world to reach colorful platforms to keep her life force up. The speed of the game was excellent and the controls seemed exclusive to be moving and double jumping. Once Spectra cleared the colorless world, she got to repeat the same level with it fully colored. The game seems like one you would play for a few minutes while waiting for something. I will remember it for the smooth framerate and jumping mechanics. 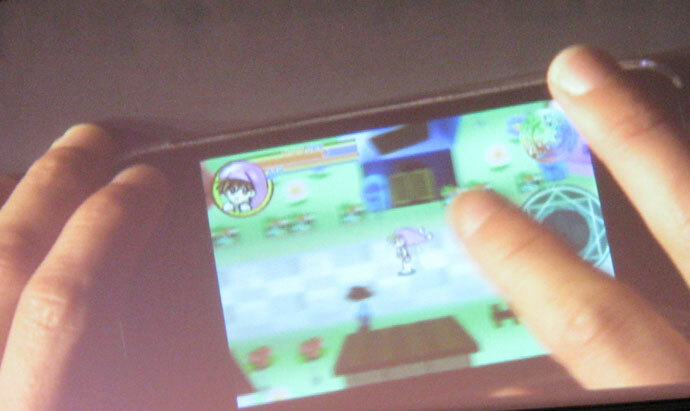 Magic Eden is a mobile RPG for iPod Touch where you control a girl who can perform both good and dark magic. For each quest, there are at least two different resolutions based on the player magic type choice. 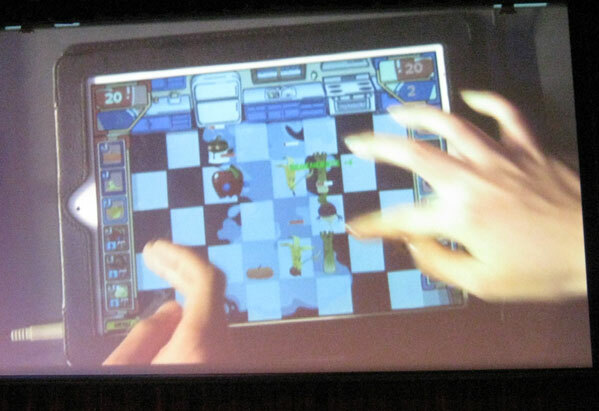 In the live demo, the player started the quest to confront a slime about doing something illegal (I think it was eating crops or something similar). The main character could not understand the slime because it was speaking in a beast language. The player decided to attack the slime with magic and it was dispatched. The team decided to reload the save and showed another outcome of the quest. After starting the quest and meeting the slime, the main character used different beast language magic to understand the slime. Of course it was all a misunderstanding. FRIENDSHIP! 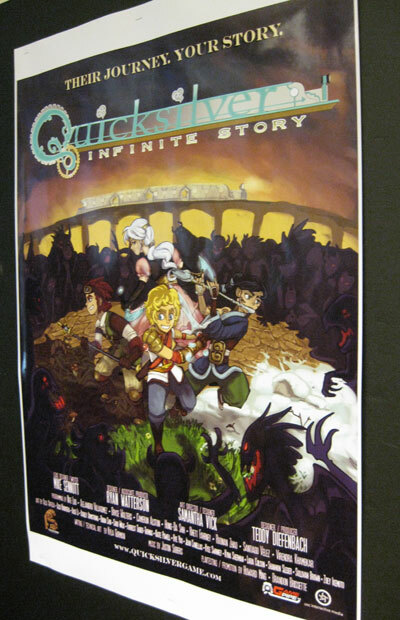 The game is targeting a younger audience based on the gameplay and artwork. 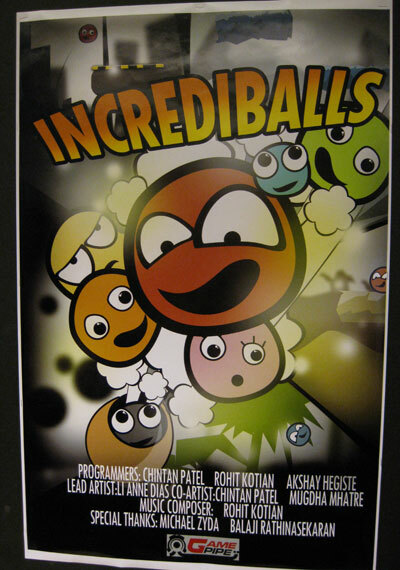 The final team showed off their game called Incrediballs through a video. It showed a ball with a comical face being launched from a cannon and the goal was to collect as much gold and powerups before it ran out of momentum in a 2D world. 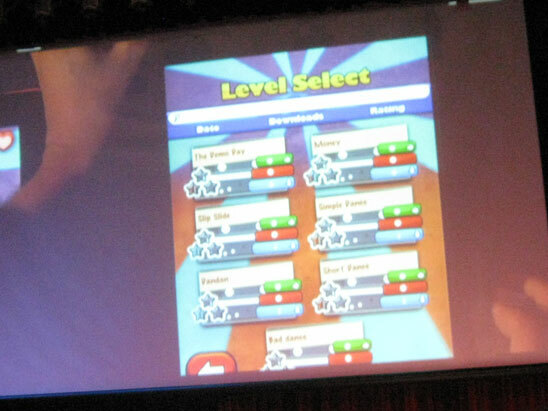 The game also boasted features like Options, High Scores, Training and the like. Since there was no live footage, I really am not sure of the game complexity. 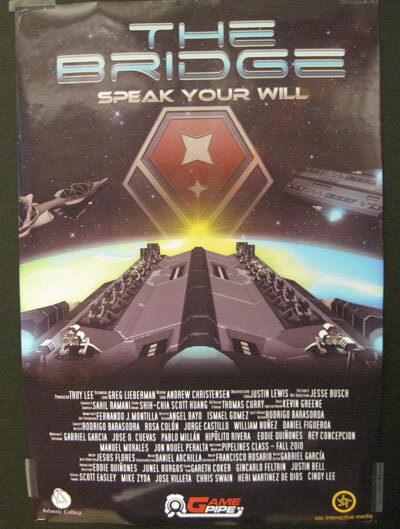 I want to congratulate the USC students who have worked so much on these games. There were a lot of new ideas shown off and it’s a great thing when I want to play most of them if/when they come out. 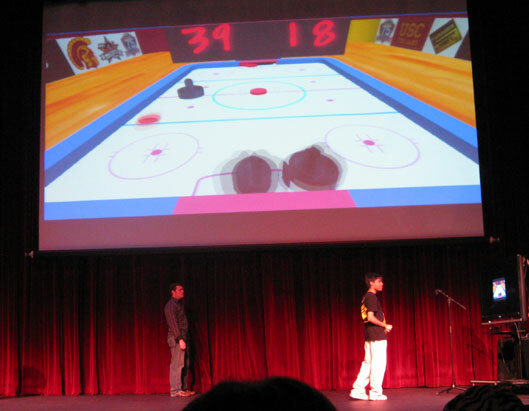 I later attended the First Move 2011 hosted by the USC School of Cinematic Arts and had a swell time trying out even more unique games. There is nothing better than spending the day playing new unreleased games with complimentary catering.